Democratic gubernatorial candidate Matt Dunne on Friday put out a new wind-turbine siting policy statement that drew a bevy of criticism from renewable energy advocates — and praise from one of his competitors. Supporters of wind energy strongly oppose putting decisions about projects in the hands of voters in one town and have vehemently fought legislation to give towns power to veto projects. The Public Service Board process is designed to consider the overall public good of the state over that of a select group of people, argued Rep. Tony Klein (D-East Montpelier), chair of the House Natural Resources and Energy Committee. “I’m pretty disappointed,” he said of Dunne’s position. But the stance won Dunne new praise from fellow Democratic candidate Peter Galbraith. Dunne’s press release includes a quote from Galbraith lauding his stance — a surprising development just 11 days before the primary election. Galbraith has long called for banning new wind projects in Vermont. Galbraith’s inclusion in Dunne’s press release raised the question of whether Galbraith, considered by many to be trailing Dunne and fellow Democrat Sue Minter in the race, planned to drop out and endorse Dunne. Not so, both said. “I don’t think you will see him dropping out,” Dunne said. Galbraith argued that he and Dunne have combined forces before. Just before Galbraith entered the race in March, the two spoke at a press conference about refusing corporate campaign contributions. Dunne insisted Friday that his wind stance was a clarification, not a change, for him. Galbraith indicated, however, that he saw it as a change. “He’s come around to a good way of thinking,” Galbraith said. Immediately though, Dunne’s wind stance infuriated renewable energy advocates, who argue that allowing single communities the power to approve energy projects means most projects that serve a greater public good, including cell towers, telephone lines and the controversial Vermont Gas Systems pipeline — would never be built. “When you support a local vote on energy siting … you show a total lack of understanding of why we even have a regulatory process,” Klein said. 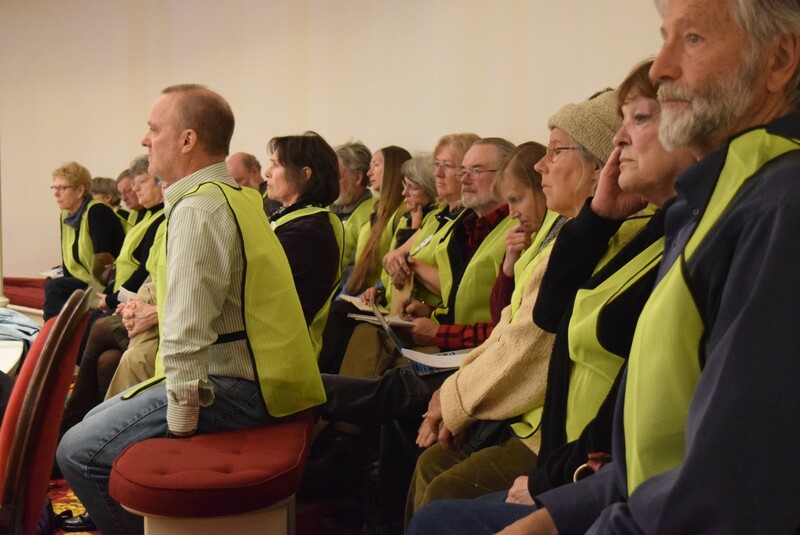 Opponents of wind projects wearing distinctive identifying vests at the last legislative session at the Statehouse. Paul Burns, who as executive director of the Vermont Public Interest Research Group has been a strong supporter of wind energy, was similarly critical. “This is a roadmap to failure when it comes to making Vermont energy independent or dealing effectively with climate change,” Burns said. A vote by a host community is also unlikely to resolve all the controversy surrounding a wind project. Lowell supported siting the Kingdom Community Wind project in town, but the abutting town of Albany didn’t. Klein, who has already endorsed Minter in the race and said he was surprised by Dunne’s announcement, argued Dunne was pandering to public sentiment over controversial projects. “In a tight race, boy, it smacks of opportunism,” he said. Minter has said she prefers less divisive sources of renewable energy and wants a more customer-friendly Public Service Board. “Wind is part of the mix,” she said.